WASHINGTON — As a Japanese-American during World War II, George Sakato felt he had to prove his loyalty to the United States. He enlisted in the Army in March 1944 and assigned to 442nd RCT. In October 1944, Pvt. George Sakato made a one-man "banzai attack" on an enemy strong point in northern France, killing 12 enemy, wounded 2, captured 4 prisoners, and successfully defended the area with his platoon, which earned him the Medal of Honor. 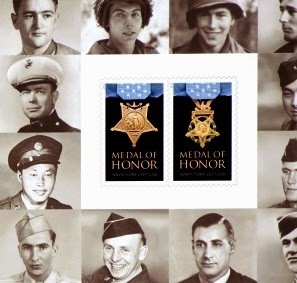 George Sakato is among the last 12 living Medal of Honor recipients from WW II who have been honored with a U.S. postage stamp set, which was introduced on Veterans Day. Sakato worked for the U.S. Postal Service for 27 years after he left the Army. The U.S. Postal Service selected to honor the last 12 living Medal of Honor recipients from WWII. Senator Daniel Inouye (HI), Vernon McGarity, Nicholas Oresko and John Hawk died before the stamp images were released.